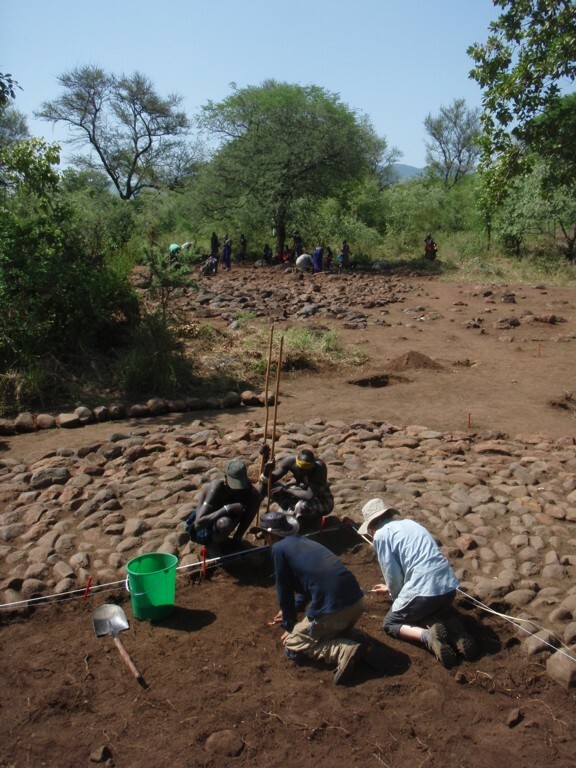 Various archaeological sites have been tested during the Mursiland Heritage Project, but the primary focus thus far has been centred upon the “benna kulugto” stone platforms. Excavation has targeted a broad distribution of the platforms to provide as clear a sense as possible with regards to the sequence of their construction and any differentiation in their usage. One small and one medium-sized platform has been subject to a detailed excavation over one quarter of their structure, with an experimentation in surface find distribution carried out over another two of the platforms of comparable size. Informed by the information obtained through these exercises, a number of test pits have subsequently been opened within another four platforms, including the largest of these (26m diameter). 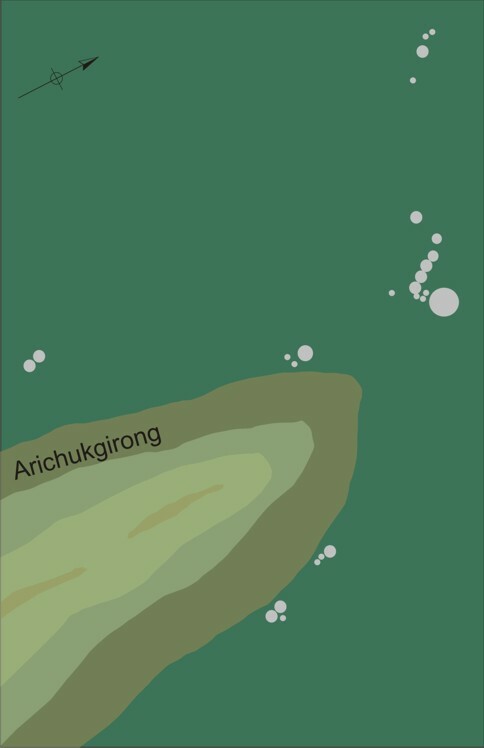 The cluster of platforms at the northern tip of the Arichukgirong landfall has deserved particular attention, and further work is planned on a selection of platforms to the east and west of the Arichukgirong. 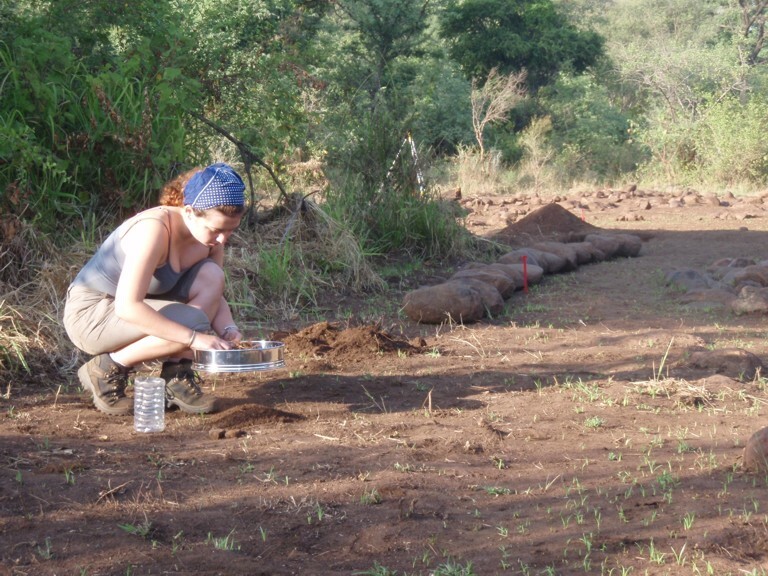 The platforms are first fully exposed, carefully removing the vegetation and soil overburden, whilst collecting and locating any finds that may have found their way into this relatively recent layer. Before their removal each platform stone is given a unique number both for geological identification and for their reinstatement at the end of the excavation season. They are then lifted in rows, and the gulley is clearly marked with a string line since this is subject to intensive sampling. 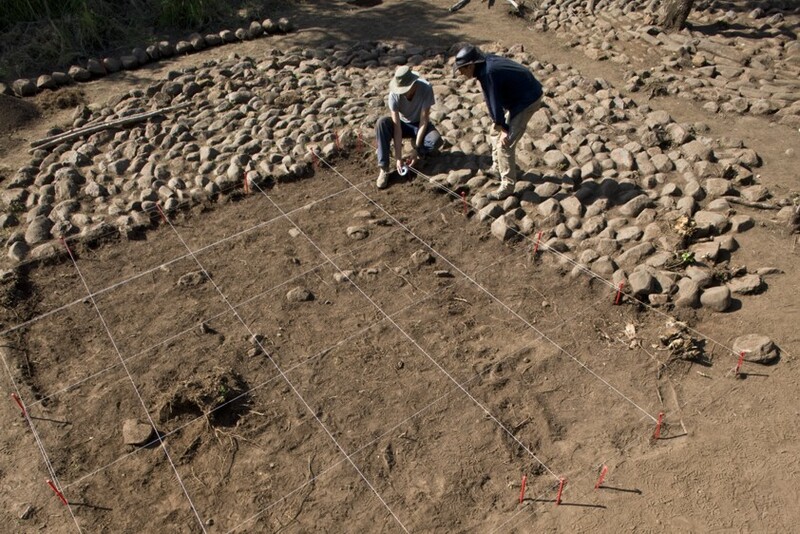 A checkerboard grid of 1x1m squares is marked out over the excavation area. Each square is then numbered individually so that the location of samples and finds can be easily identified and presented as a distribution. Layers are later given single numbers for the whole excavation area. 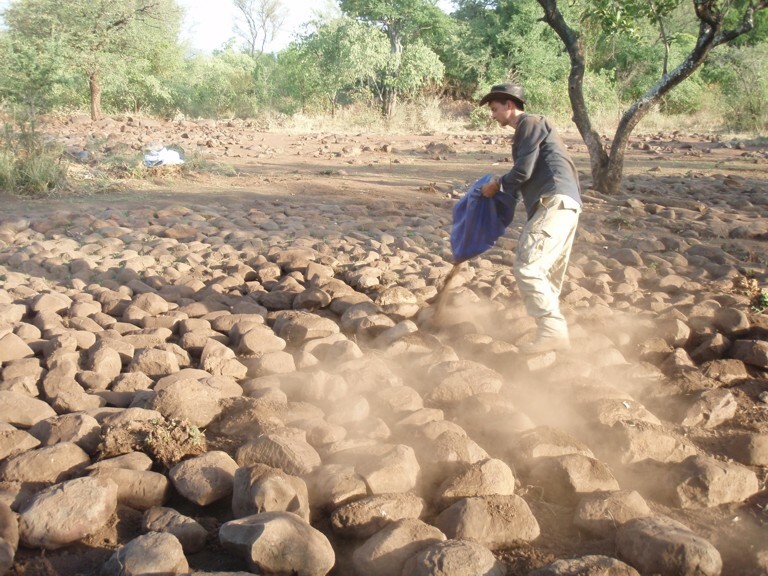 All the soil removed from each square is then subject to sieving at 10mm, 4mm and 2mm apertures so to maximise finds retrieval, and soil samples are collected from each square and from close intervals along the gulley for analysis of the variation in the chemical properties of differing layers across the excavation area. This is carried out using a handheld x-ray fluorescence (XRF) spectrometer. Samples from test pits opened at various points away from the platforms are also tested to provide comparative baseline data. Additional samples are collected for bucket floatation for the retrieval of organic evidence such as seeds or charcoal. 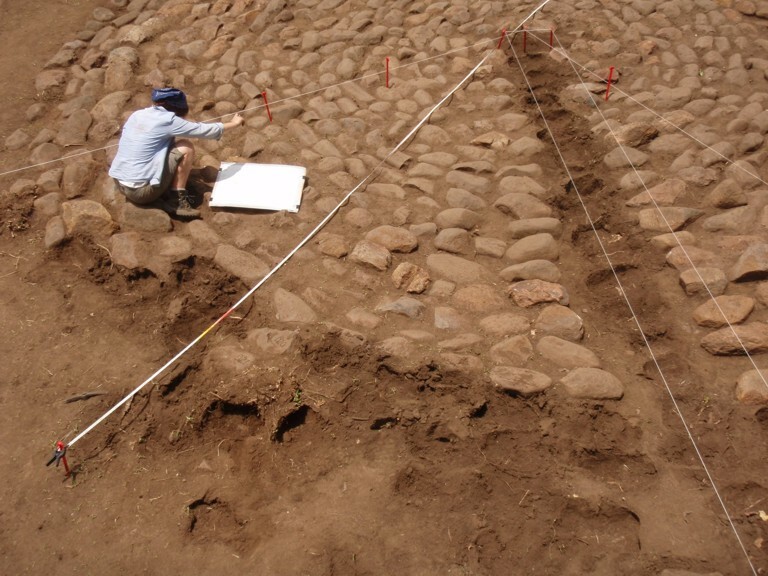 All platforms are pieced back together at the conclusion of excavation, which is possible having labouriously planned and numbered all the stones prior to excavation. This is an illustration of respect both for the past and present communities in Mursiland and an effort to enable the best possible conditions for their preservation within a landscape that is constantly changing. Much of the analysis is on-going, and a great deal more is need to gain a clearer understanding of these enigmatic features. Publications with more detailed interim results may be found here. The platforms appear to have been constructed upon a ground surface that around the platforms has been sealed by a layer of clayey silt, and is obviously sealed by the stones themselves. Interestingly, no sub-platform features have been found, and only one cut feature has been identified from the perimeter of one of the smaller of the platforms. This perhaps held an upright post or stone, maybe even a stela. Nearly all the platforms have contained considerable quantities of bone. In the main this is highly fragmented, perhaps deliberately, and contains both burnt and unburnt elements. Articulated lower limbs have also been identified, and the species is predominantly of cattle. The majority of the bone is found between the stones at the centre of the platform, with the distribution decreasing towards the platform perimeter. Perhaps surprisingly, and in contrast to the other platforms, the largest platform contained no bone at its centre whatsoever. The stones that make up the platforms are volcanic but ultimately varied in geology, and seemingly selected for inclusion at different point of the platform architecture. Some of these are elongated and water-worn and perhaps derive from a river bed, although very few of these have been identified within the local landscape. In addition to the bone deposits, struck lithic flakes from rhyolitic sources have been collected along with other microlithic specimens. Analysis of the environmental samples is underway, although these appear to be very promising, and the analysis of the soil samples shows a high nutrient ration towards the centre of the platforms and along the gulley, perhaps implying that organic deposits, perhaps fluids, have been deposited there in addition to the bone and chipped stone finds. Towards the perimeter of the largest platform a number of the stones had been displaced by the roots and trunk. Here we have found two ceramic artefacts. One is a portion of a pot handle impressed with a roulette decoration, and the other is a half fragment of a circular flange labret (or plate) worn within an incision either in the ear or the lower lip. In Mursi society both pottery and lip-plates are associated with the women. 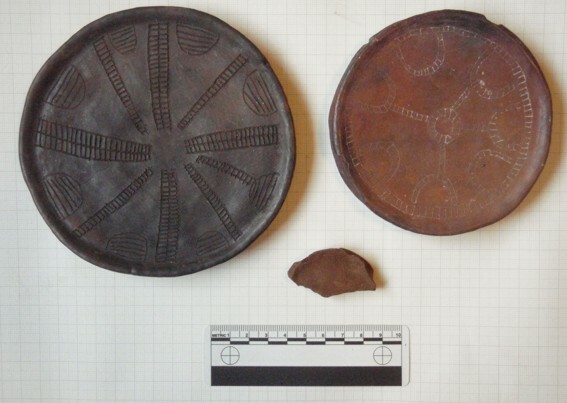 Whilst this is clearly a later addition to the platform it is nonetheless an early – and perhaps the earliest – example of such an item in the Lower Omo Valley. Interestingly, the tree is a “ragai” tree used as shade against the harsh African sun, and traditionally used as a meeting place for political discussion, initiation and other matters, but taboo to women. To be found from within this context therefore, is perhaps unusual. What are the benna kulugto? There are a number of ideas that could be developed to interpret the “benna kulugto” stone platforms. One Mursi interpretation, for example, is that these are either floors to houses built long ago and before the Mursi ‘arrival’ into these lands. 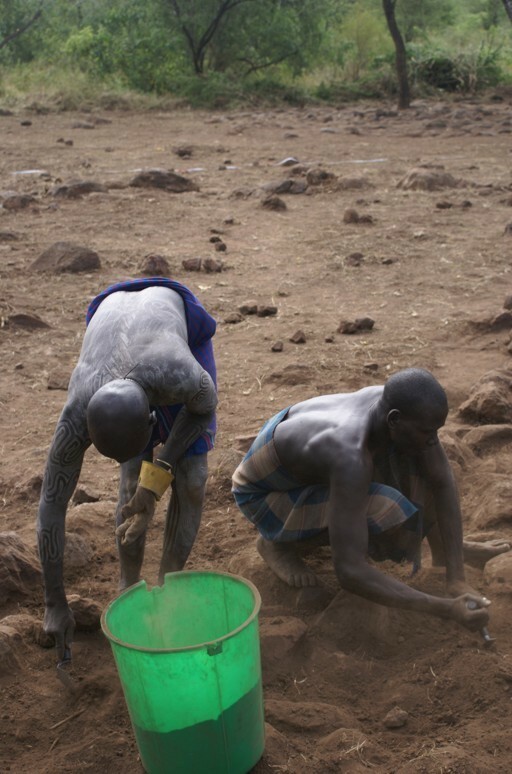 According to Mursi oral histories (see Heritage) the climate was much wetter in these times, and the purpose of the stone floors was to raise the occupants above wet ground. These occupants, according to the Mursi, are ancestors to the Bodi ethnic group who now live in lands to the north of Mursiland. The archaeology, however, is perhaps pointing towards a slightly different story. The combination of butchered and ‘processed’ animal bone, with the likelihood of organic deposits and perhaps fluids (stomach contents, blood etc.) also being administered to the platforms, and other evidence for fire-related activities (discussed within the interim reports), would all not be out of place in sacrificial practices. Even the stones and the architecture of the platforms could support this argument, although further work is required to confirm this as well as to understand the communities for whom these sites were so important.